Part of the show Sniff! Sniff! There are certain smells and tastes that some people love, but others hate. Darren Logan works at the Sanger Institute in Cambridge, looking into the genetics underlying responses to smell. He spoke to Ginny Smith. Ginny - Why do different people respond differently? 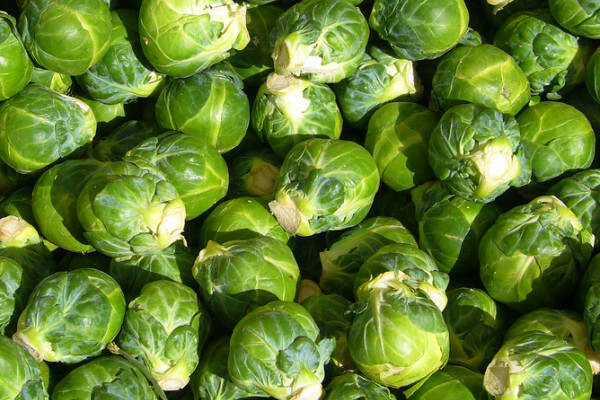 Why do I love Brussels sprouts and Kate hates them? Darren - Well, it goes down to your genes in the end. We all have olfactory receptor genes and these are the genes that encode the proteins that detect different smells. It turns out that we actually have huge numbers of variants of these throughout the population. And so, if I have a copy of a gene, and you have a copy of a gene that differs, perhaps I can smell it and you can't. Therefore, I will develop a preference for it and you won't because you can't smell it. When we add this variance across hundreds of genes that are involved in smell, what it ends up meaning is that we all smell the world slightly differently from each other. Ginny - So, does that mean that we've actually all got slightly different receptors in our noses? Darren - Yes and that's actually something that has only been realised in the last few years or so. The level of variance with these genes is that they're really astounding. In fact, they're perhaps the most variable genes that humans have apart from our immune system. Ginny - How do you go about studying something like this? Darren - It's actually quite hard. So, we tend to study model organisms, largely worms, flies and mice. The reason for this is we can train them to respond to different smells. So, when we have different versions of these genes in different animals, we can ask when the animal can smell it, it can be trained to that smell, when it can't it cannot be trained to the smell. And therefore, by asking how they respond to different smells, we can work out what version of the gene they have. Ginny - So, does that mean you can actually breed mice that can and can't smell different things? Darren - Absolutely, yeah. In fact, we've done so, but we didn't actually mean to. So, we have maybe 20 or so inbred lines of mice that we commonly use around the world. What we're realising is that just by accident, some of those can and can't smell certain smells. Ginny - What kind of smells are there that are controlled just by one or two genes? Darren - A famous example, one of the very earliest ones found in 1977, is one of the most commonly used lab mice strains called Black 6. It turns out it can't smell a chemical called isovaleric acid. Isovaleric acid is the smell of sweaty gym socks or blue cheese. So, there's this little mouse strain that can't smell cheese. And so, in my lab, we're actually working at the moment to try and identify the gene responsible for this. Ginny - That sounds like quite a good gene to have, if you live with me who leave their socks lying around. Darren - Absolutely. And actually, humans also and so these are called specific anosmias which is like we heard earlier, and general anosmia is when we can't smell anything. A specific anosmia is when we can't smell one thing. Humans also have a specific anosmia to isovaleric acid. So there is indeed people out there who can't smell such things. Ginny - Oh, lucky people. Now, I think you actually brought with you some little vials of different smells that some of us should be able to smell and some shouldn't based on genetics. Can we have a go? Darren - You can, yes. I didn't bring you isovaleric acid because it smells so bad that it would stink out your studio. I did bring another thing. And so, I'll pass it around and see if one of you can identify what the smell is. Kate - Let me have a go. I can definitely smell something. It's quite sweet, but I wouldn't be able to pinpoint it. Can I ask? I have what my family terms the famous Lamble nose. If I have room for extra senses, am I at an advantage here over Ginny? Darren - Perhaps, yeah. I mean, there is a structural element too. So, if you have a good airflow through your nose, for example, and you can often smell better, people who have deviated septums often struggle to smell. So, I can smell it from here actually. Kate - Can you pinpoint it? Ginny - I can definitely smell something. It's kind of sweet, like sweet shop candy floss type things. It's quite pleasant. Darren - You're close. It is actually the smell of beta ionone which is the distinctive smell of Parma Violets. Kate - Oh, yeah. Now, you tell me. I can pinpoint it to the '70s sweet that you don't want to eat too much of. Darren - Exactly. So, interestingly with this smell is that just this year in fact, a really beautiful study by a guy called Jeremy McRae who's a colleague of mine at Sanger. They showed that 18% of the British population can't smell that or have no ability to smell that whatsoever. But also they showed, in a really nice paper, that people that can smell this have a greater preference for air fresheners or detergents that have this chemical in it than those who can't smell it. So now we're beginning to understand that our ability to smell different chemicals also influences our choice for consumer products. Ginny - So, the fact that we could all smell that means that we must all have that same gene. Darren - That's correct, yeah. Ginny - And did you bring another one? Darren - I did. I brought another one. This one is perhaps slightly easier. Pass this one along. Kate - That's very, very strong to me. I'm not really good at pinpointing what they are. They should have a new game like Pictionary for what it is. Kate - It's really unpleasant. Ginny - No, that's pollen-y. That reminds me of hay fever. Darren - Absolutely, yes. So, this is something called cis-3 hexenal, also known as leaf alcohol, and it's the smell of cut grass. It's very distinctive, and 3% of British people can't smell that. So again obviously, you two probably can. Kate - But you associate it with something negative like hay fever. Ginny - Yeah, that's definitely an unpleasant smell to me. Darren - That's interesting because often it's used - some people believe that cis-3 hexenal has some sort of innate meaning to us and so, it's used often in aromatherapies to relax people. Kate - Apart from Ginny. Ginny - No, it makes me think that my eyes are going to start itching and my nose is going to start streaming even though it's not. But it definitely makes me think of that. Fascinating! So, why do we have these differences? Do we have any idea? Darren - So, there are two theories. One is that there is some sort of evolutionary advantage for certain smells or not, and we don't actually have good evidence for that yet, and perhaps because we haven't studied enough of them. The other is it's something called genetic drift. Basically, there's no real advantage to smell or not smell something. So over time, the genes mutate and change, so some people can and some people can't. Ras, Raf, Mek, Erk: cell signalling and the future for cancer treatment? What makes some people tastier to mosquitoes? Miracle Berry turns sour into sweet!